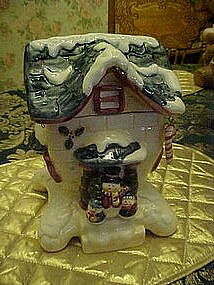 Adorable cookie jar is an ice cottage. A perfect home for this little snowman family. It has a candy cane that dangles from one corner of the roof.Made of hand decorated ceramic. Measures just 8 1/2" tall and is damage free. You will love this for those special Christmas treats. Made in china.